Omega Residency features front desk facility to its guests. 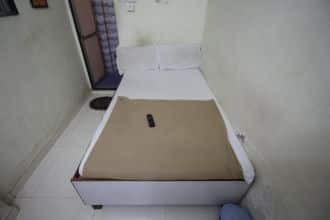 Sahar P. T. Colony No.2 Bus Stop is approximately 1 km and Mahakali Caves is 4 km from this hotel.This hotel in Mumbai has 10 rooms spread over 1 floor. Situated in Mumbai, this hotel offers an attached bathroom with hot and cold water supply and a wardrobe. A luggage storage is offered by this hotel in Mumbai. Along with medical aid, laundry and room service are rendered to the guests.Patrons may enjoy tourist attractions such as Dolphin Aquarium (3 km) and Pushpa Narsee Park (5 km). Vile Parle Railway Station is 3 km and Chhatrapati Shivaji International Airport is 4 km away from Omega Residency.